If the Pleistocene megafauna held a popularity contest then I’m certain that some species would pop up more than others. The woolly mammoth (Mammuthus primigenius), the giant ground sloth (Megatherium americanum) and sabretooth cat (Smilodon fatalis) are probably the gold, silver, and bronze of extinct mammals. Diego from the Ice Age films, the striped menace in 10,000BC, and (perhaps showing my age) the sabretooth in Sinbad and the Eye of the Tiger are all clearly typical of Smilodon sp. The long thin canines protrude well below the lower jaw, and the robust bear like bodyform that this genus is known for are obvious in all three cinematic depictions. The reason that Smilodon fatalis has embedded deep into the collective unconscious can be put down to a number of factors. It is certainly true that the species is incredibly well-known, thanks to the hundreds of thousands of bones found at the Californian tar pit site of Rancho La Brea. That Rancho la Brea is in the middle of downtown Los Angeles has probably given Smilodon the edge in Hollywood. There is also the thrilling fact that this species was encountered by the first modern humans to enter the Americas. 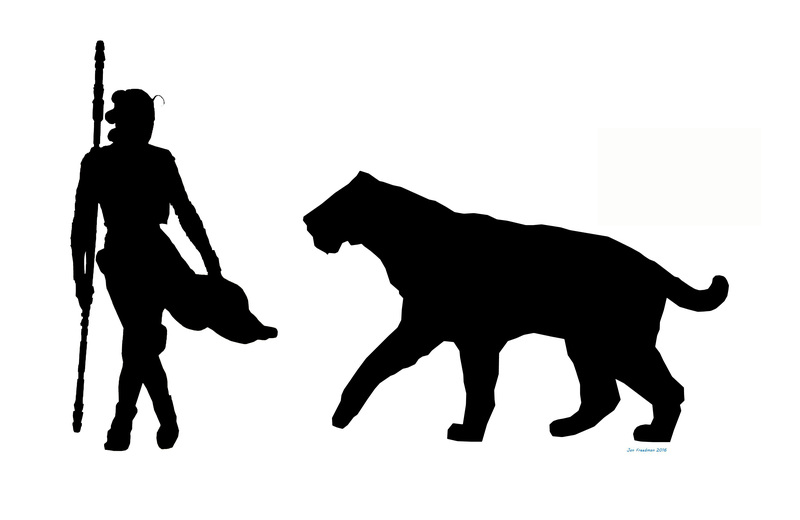 Radiocarbon dating has shown that the North American Smilodon fatalis and South American Smilodon populator overlapped for two to three thousand years with the ancestors of Native Americans. How must they have felt upon coming face to face (or face to mouth) with this incredible cat? However, if Smilodon is the showboating extrovert of the extinct Machairodontinae (the subfamily of Felidae to which the sabretooth cats belong) then there is also another, less well known relative who has been unfairly relegated to the sidelines. I’m talking about the wide-ranging genus Homotherium, and in particular Homotherium latidens. H. latidens, also known as the European Scimitar cat (pretty badass, no? ), has some very interesting characteristics that should make it better known. First of all, it was originally described from British fossils by the great Sir Richard Owen. This is a BRITISH sabretooth, which makes it infinitely better than most other sabrecats. Whereas Smilodon has long, thin canines, Homotherium has shorter, wider falciform canines, triangular in shape and wicked sharp. In fact, while the canines of Smilodon start off serrated, the serrations are rapidly worn away in the adult animal, but Homotherium retains serrations even as an adult, giving the teeth the appearance of a steak knife. Even its molars and premolars are serrated. The bodyform of Homotherium is also different. Smilodon is essentially bear-like in outline, evolved for ambush hunting and grappling with struggling prey so it can precisely place its killing bite. Homotherium is built more like a cheetah: for long-range pursuit and running down their prey to exhaustion. It used to be thought that Homotherium went extinct in Europe during the Middle Pleistocene (about 400,000 years ago) but a few finds cautiously suggest it hung on until the Late Pleistocene (100,000-10,000 years ago). In 2000, a trawler fishing in the North Sea brought up a fossil of Homotherium (The North Sea is Holocene in age and the seabed contains many Holocene and Pleistocene fossils). This distinctive jawbone from the Scimitar cat was radiocarbon dated to 28,000 years; more recent than the Neanderthals, and overlapping with the time when early Europeans were painting their fabulous images in the caves of Chauvet and Lascaux. The other circumstantial evidence for late survival comes from two late Pleistocene English sites, the type locality (where it was first described) Kents cavern in Devon, and Robin Hood cave in Creswell crags. Five canines and one incisor were discovered in Kents cavern but recent research has shown that they may actually have been brought from somewhere else by the Pleistocene inhabitants of Devon. Stable isotope signatures from the teeth strongly indicate that they did not originally come from the cave vicinity but may have been traded long distance (whether as fossils or from living animals we don’t know). The Robin Hood cave canine has also been the subject of controversy almost since the day it was dug up. Some of the original workers on the site allege that the tooth was planted by the supervising palaeontologist Professor Sir William Boyd Dawkins. 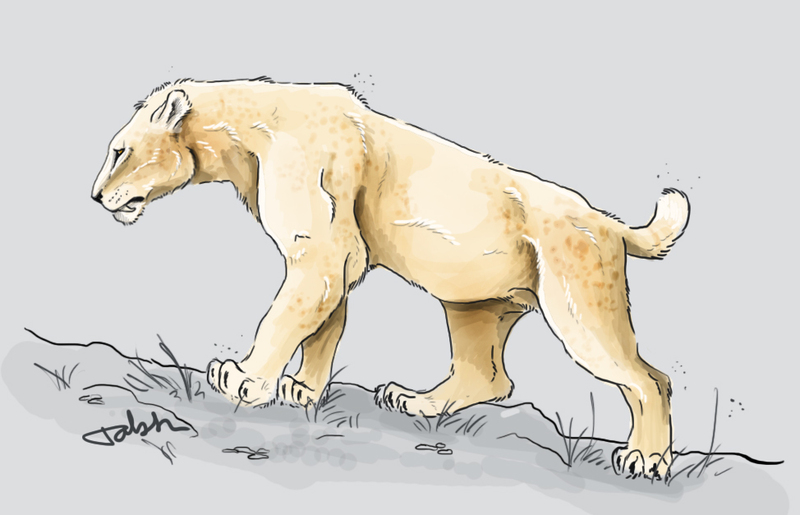 Whatever its longevity, Homotherium latidens was a very successful species, apex predator of the Eurasian steppes, only rivalled by the cave lion (Panthera spelaea). If it did survive until the end of the Pleistocene, perhaps one day some lucky spelunker will uncover a new Lascaux or Chauvet, with pictures of the living animal. Merriam, J. C. and Stock, C. (1932), The Felidae of Rancho La Brea (Carnegie Institute of Washington Publications). This entry was posted in Sabre tooth Cat and tagged Cave Lion, Chauvet Caves, Creswell Crags, European Scimitar Cat, Ground sloth, Homotherium latidens, Kents Cavern, Lascaux Caves, Robin Hood Cave, Sabre tooth cat, Smilodon fatalis, William Boyd Dawkins, Woolly Mammoth. Bookmark the permalink. come back later on. I want to encourage one to continue your great job, have a nice afternoon!